I am a marine biologist born and raised in a small village outside of York in the UK. I studied for my undergraduate degree at the University of Liverpool’s marine biology lab based on the Isle of Man. I then completed my M.Sc. in biodiversity and conservation specialising in marine biology at the University of Leeds. I now work as the Assistant Curator of the Burj Al Arab Aquarium based in Dubai where I help to run the Dubai Turtle Rehabilitation Project and help to manage various fish and shark breeding projects. 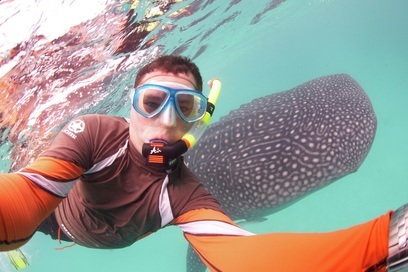 I have recently started a post-graduate study with Heriot-Watt University based in Edinburgh and Dubai researching the ecology of whale sharks in the Arabian Gulf and Gulf of Oman. In my spare time I can usually be found diving and trying to improve my underwater photography skills.